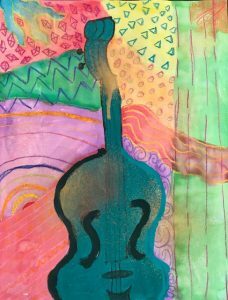 A Paint to Music submission from a 5th grade student. Nearly 1,300 children from four schools in Central Texas participated in the Austin Civic Orchestra’s first annual Paint to Music contest, open to students from pre-kindergarten to 12th grade. The young artists created artwork while listening to a movement from Tchaikovsky’s Fourth Symphony. 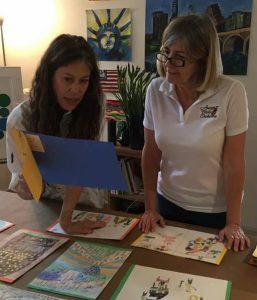 Teachers from the participating schools — Cedar Creek Elementary School, Hyde Park Elementary School, Dripping Springs Elementary School and Holy Family Catholic School — selected the top pieces to submit for the contest, a total of 303 works. “Through Paint to Music, we encourage our youth to explore the language of music and experience how it enhances creative expression,” said ACO Education Director Kathy Murdock. Kathy and Zoey Upshaw, founder and principal instructor of Austin Creative Art Center, along with ACO President Amy Crandell, evaluated submissions and selected winning pieces to showcase in a free art show on May 13 from 6-7:30 p.m. in the lobby of Bates Recital Hall. Following the show, the Austin Civic Orchestra will perform the Tchaikovsky symphony and classical music with Spanish flair as part of its Golden concert. Zoey Upshaw and Kathy Murdock discuss an entry by a pre-K student. We talked with Tracy Lake, an educator whose students participated in Paint to Music, about the experience. Tracy is general music and choir director at Holy Family Catholic School, teaching pre-kindergarten through 5th grade. How did your students respond to the first listening of Tchaikovsky’s Fourth Symphony? The students thoroughly enjoyed their first listening to the symphony. “Wow, that’s really cool!” was a common response. Their favorite movement was the second movement. How did you help your students engage with the symphony before creating their artwork? The students experienced the analysis videos that were provided. Then, we listened to each movement and the students shared ideas of what it might look like or what story might go with the music. The students were also encouraged to move to the music as they experienced it. The older students were also allowed to brainstorm in words or picture before we dove into the actual art for the contest. How did your students feel about creating their art? Only a couple of students were leery of the assignment. Most of the students were really serious about their drawings and could not wait to share what they had drawn. Did creating art help your students explore classical music? Yes, giving them the freedom to listen to all of the elements and not focus on one or two helped them to really hear the different instruments and how the music was put together. Many students are still humming various motifs! As an educator, what did you enjoy about the project? I appreciated the push outside of my curriculum box and the opportunity to give them some extra freedom within experiencing art and music together.